If you take good care of your hearing aids, your hearing aids should take good care of you by functioning properly and continuing to help you hear better. The care and use of hearing aids can vary between different hearing aid styles, hearing aid manufactures, your lifestyle, and your physical ability. Your Audiologist will initially orient you to the care and use of your hearing aids when you are initially fit. Reviewing proper maintenance can be extremely beneficial as you become more comfortable with your hearing aids. Hearing aids require routine maintenance at home and in the office with your Audiologist. In general, the cleaner and dryer you keep your hearing aids, the better they will function and the longer they will last. Water and Moisture: Moisture from the environment and from our bodies can be hard and damaging to hearing aids. Thankfully, many hearing aids are moisture resistant, but can still have moisture problems over time, especially from perspiration. Follow these moisture tips: 1. Remove your hearing aids before bathing or swimming; 2. Do not leave your hearing aids in the bathroom or other humid environments; 3. Do not immerse your hearing aids in water. Moisture reduction containers are available to help reduce moisture and condensation, which can damage your hearing aids. Physical moisture protectors are also available for hearing aids as well. These fabric sleeve protectors create a barrier between perspiration and hearing aids. Hair/Body Products: The fine particles of hair products, make-up, and lotion can clog the microphones, volume control, program button, and create a general coating on hearing aids. Always remove hearing aids before using body care products including hairspray, hair gel/oil, facial lotion, etc. Storage: Store your hearing aids out of the reach of children and pets. Pets are attracted to hearing aids because they smell like people and may emit a high-pitched sound if left turned on. Hearing aids damaged by pets is one of the top reasons why people have to file a replacement claim for an in-warranty hearing aid or purchase a new hearing aid if out of warranty. Ear Wax: Ear wax can plug your hearing aid and interfere with the sound transmission. Ear wax that gets into the electronic components can cause the hearing aid to malfunction. Removal of ear wax from a hearing aid varies by style and manufacturer. If you have excessive ear wax production, you may need to schedule routine ear wax removal with your Audiologist at Mile High Hearing or your primary care physician. Cleaning: Clean your hearing aids on a regular basis with a soft, dry cloth. Never use alcohol, solvents or cleaning agents since they can be hard on the plastics and electronics of hearing aids. A lightly damp, alcohol-free wipe can be used on most hearing aids. 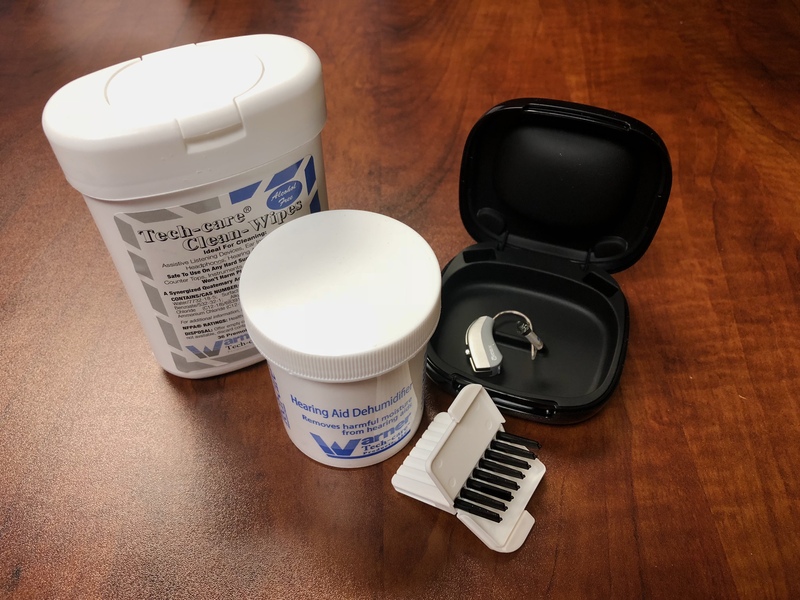 Special care products for your hearing aids are available at Mile High Hearing and the Audiologists can discuss specific cleaning strategies for your hearing aids and your needs. Routine In-Office Care: A routine hearing aid check and clean is recommended every 6 months. People that wait longer periods of time to come in between appointments often report increased difficulty hearing and increased frustrations. People that see their Audiologist every 6 months tend to have an increased ease of hearing aid maintenance and their overall hearing healthcare.